Ancestors Of Antibiotic-Resistant Superbugs 'Crawled Out' Of The Ocean 450 Million Years Ago : Goats and Soda We think of antibiotic-resistance as a modern-day problem. Now scientists have evidence that these superbugs have been around for eons. Clues to their origin are offering clues to their defeat. The ancestors of modern hospital superbugs may have lived in the guts of ancient land animals. 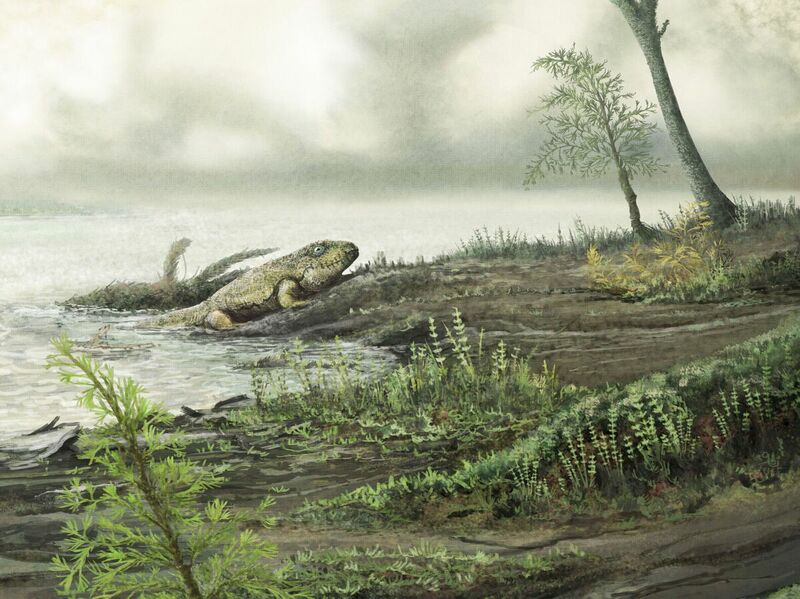 About 450 million years, animals made one of the most important decisions in Earth's history: They left the wet, nourishing seas and started living on the dry, desolate land. At that moment, humanity's problems with superbugs probably began. Scientists at the Broad Institute have found evidence that an important group of antibiotic-resistant bacteria are as old as terrestrial animals themselves. "These bugs likely lived in the very first creatures that sort of crawled out of the sea and came onto land," says Ashlee Earl, a geneticist at the Broad Institute, who co-led the study. During that time, these proto-superbugs seem to have picked up an arsenal of traits that helped them thrive in hospitals and even thwart some of the most common antibiotics, like penicillin, Earl and her colleagues report Thursday in the journal Cell. "These bugs became part of these creatures' gut microbes, just like they are part of our gut microbes today," Earl adds. And they were probably part of the microbiome of all the animals that have ever inhabited land over the past 450 million years or so, even the dinosaurs. "It's cool to think of Tyrannosaurus rex traipsing across the planet, carrying these bugs in its gut," Earl says. "But we think that's very likely." The superbug we're talking is a little guy called Enterococci. And it's the godfather of superbugs. Because back in the '80s, Enterococci bacteria were one of the first pathogens to become resistant to almost all the antibiotics available. "That was really the dawn of the superbug era," says the Broad Institute's Michael Gilmore, who also co-led the study. Today Enterococci bacteria have become a major source of hospital infections in the U.S. The microbes sicken nearly 70,000 Americans and kill more than 1,000 each year, the Centers for Disease Control and Prevention says. "Why, out of the thousand or so species of bacteria that live in our guts, have Enterococci become a superbug? What makes Enterococci special?" Gilmore wondered. To figure it out, he and Earl sequenced the genomes of 24 species of Enterococci found in the guts of all sorts of animals, from bees and pigeons to humans and fish. Then they sifted through the bacteria's genes and figured out which ones were unique to Enterococci — and not found in close relatives. "We whittled it down to about 126 genes unique to Enteroccoci," Gilmore says. When they looked at what those genes do, Gilmore and Earl quickly realized Enterococci's secret weapon: "Basically, it's like the bacteria put on a hazmat suit," Gilmore says. Many of these special genes are involved in hardening and fortifying the bacteria's cell wall. "They help make the bacteria rugged and able to withstand drying out and exposure to disinfectants," Gilmore says. And the data suggest the superbug picked up this "hazmat suit" 450 million years ago when animals were just beginning to colonize land — probably to help them survive the transition from living in marine animals to leaving in land animals. Gilmore says he came up with hypothesis while remembering his pet goldfish. "I was thinking about that little string of poop that would come out of the fish," he says. "Remember, these are bacteria that live in the guts of animals, but sometimes they are excreted out in feces." When the excretion happens in the ocean, the bacteria end up in an environment that's not too different than an animals' gut — at the bottom of the ocean floor — where it's moist and filled with nutrients. But when bacteria are excreted out onto land, they find themselves in a much harsher environment. "They are exposed to U.V. light, baked in sun and often end up starving and drying up," Gilmore says. So to survive, they needed to develop a hazmat suit. And today, that same suit — which helped Enterococci conquer land — is helping them conquer another frontier: hospitals. Their ability to withstand drying out, starvation and harsh chemicals helps them to survive on a hospital table or curtain — and even resist disinfectants and detergents. "This ability has predisposed them to becoming superbugs," Gilmore says. Now that we have the blueprints to their hazmat suit, we can start finding ways to compromise it.